Our stunning range of dry bags and backpacks was created to keep your belongings safe and dry in the most extreme places - in the sun, sea, sand or snow. 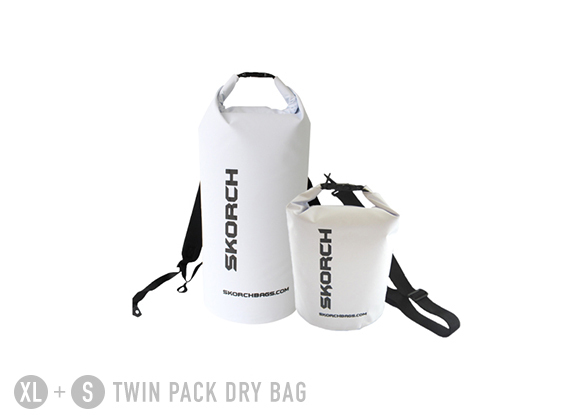 Keeps clothes, cameras, phone and other possessions clean and dry in all conditions. Made of durable UPVC material this bag is built to handle all conditions no matter what you throw at it. With a fully waterproof skin, it is simple to clean and will continue to look great for many years to come. "I purchased this product for sailing on my trimaran and keeping my clothes and electronics dry. While sailing there is always water splash and the occasional water inside the small cabin. I trailer my boat in, so the bag needs to handle moving around and be dropped on different hard and dirty surfaces as i rig the boat....... I would definitely recommend for anyone that like to be adventurous and not fear water on your personals items." Bag was awesome. Everyone wanted one when we got swamped by an idiot with no knowledge of laws of the water - guess what was the only thing in the boat that was dry? Including stored items. By day two all the kids were packing their stuff in my bag. It got full. The backpack straps are so comfortable (no scratching) that even the kids fought over carrying the pack and it also left everyone with two free hands unloading the boat. 7 yr old could properly fold and clasp seal. Will buy more. "This bag is awesome. Bought it for Maui. Went rappelling with it, zip lining, beach bumming. The straps are awesome and a few rogue waves ran up shore and everybody's stuff got wet but I fished the floating bag out of water and everything was bone dry. Awesome product, the best thing I bought for the trip." Can be used for a wide variety of sporting activities and is strong enough to act as a work or school bag to carry books, laptop and folders. As you would expect, our products are backed by a 100% money back guarantee.